Sometimes I love spending time in the kitchen assembling the ingredients for an Indian meal. And other times – not so much. The list of spices for many dishes is extensive, so I tend to take shortcuts on a weeknight or other busy times. My biggest and favorite shortcut is a complete cop-out: Maya Kaimal curry sauces. These sauces are found in the refrigerated case, often near the cheese (at Whole Foods and, surprisingly, the Amish Market in Kingston). They taste fresh, they are vegan and all natural (nothing you can’t pronounce), and all you have to do is empty the plastic tub into a pan, add cut up meat, paneer, tofu, or veggies (those little Thai eggplants are great), and simmer until done. You don’t have to, but when I’m feeling ambitious, I slightly brown lamb first when I use that, but don’t feel the need to do so when I use chicken. And when I use chicken, I use boneless, skinless thighs, since I can still say with assurance I never met a boneless, skinless chicken breast I liked (sorry everyone). I often throw in a half cup or so of frozen peas near the end. Meanwhile I am cooking some basmati rice on the back burner. 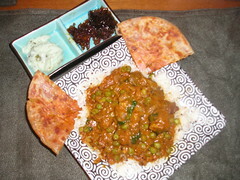 My recent dinner pictured here, lamb in Maya Kaimal Tamarind Curry, was also accompanied by delicious frozen Paratha (with potatoes and paneer inside), from Patel Cash & Carry in North Brunswick on Rte. 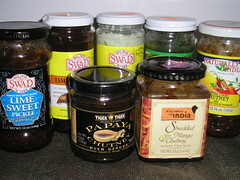 27.Of course, when I bring dinner to the table, that opens a whole other set of options – see all those chutneys? This excess of condiments is so typical of me, I know I will take a lot of ribbing on this one!